Raimundo Guitars at Guitar From Spain, one of the best guitar makers in Spain have recently introduced a new model of guitar in its catalog. Its not another classical, flamenco or acoustic guitar. Its a completely new instrument. The Classical Baritone Guitar. 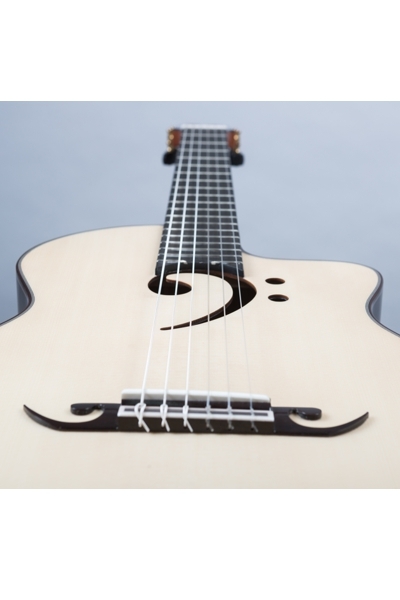 The guitar Raimundo Clave de FA is a new and unique instrument that has been created to complete the instrumental family of guitars. The baritone guitar Raimundo Clave de FA is a guitar with a longer scale length, larger body, and heavier internal bracing, so it can be tuned to a lower pitch. This special guitar is a must to have for guitar collector and for the experimental musician. Totally hand made by Raimundo guitars in Spain, The Raimundo Clave de Fa-C is a beautiful baritone guitar with a deep and interesting tonal range. This guitar has an scale lenght of 660mm, cutaway body, solid german spruce top and ebony Macassar back and sides. 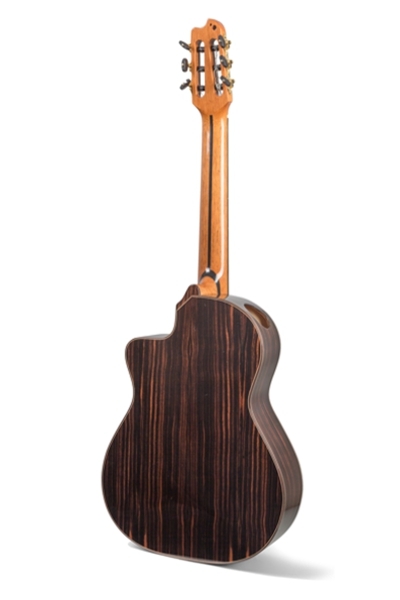 The neck is made of american cedar with ebony fingerboard. 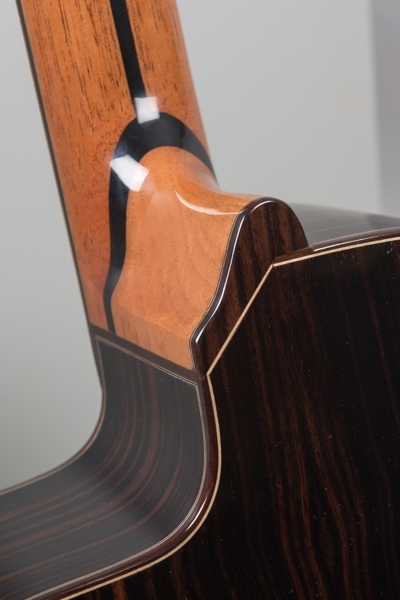 Apart from the original bass clef shaped hole on the top of the guitar, the guitar features a beautiful bridge and a “sound port” on the upper bout of the guitar. 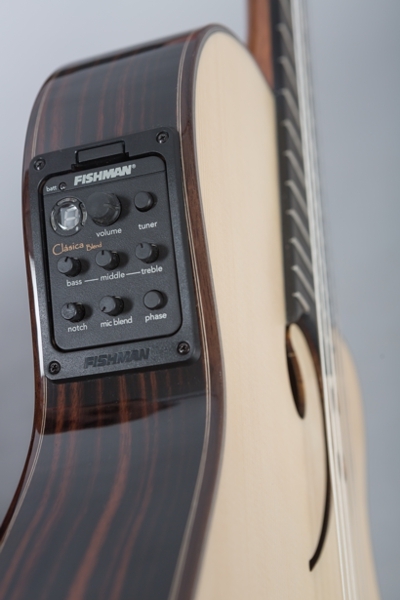 An electrified version is also available, the model Clave de FA-E with a Fishman Clasica Blend preamp system, combining a piezo pickup under the bridge and an internal microphone inside the preamp. – Nut width: 50.5 mm. Posted in Acoustic Guitars, Classical guitars, electro classical guitars, electroacoustic guitars, Flamenco guitar music, Flamenco guitars, guitar, guitar making, Guitar manufacturers, guitar techniques, guitar tips, musical instruments, Spanish guitars and tagged baritone guitar, best classical guitar, buy spanish guitar, Guitar, guitar raimundo, raimundo clave de fa, raimundo f clef, raimundo guitar, Spanish guitar making. Bookmark the permalink. 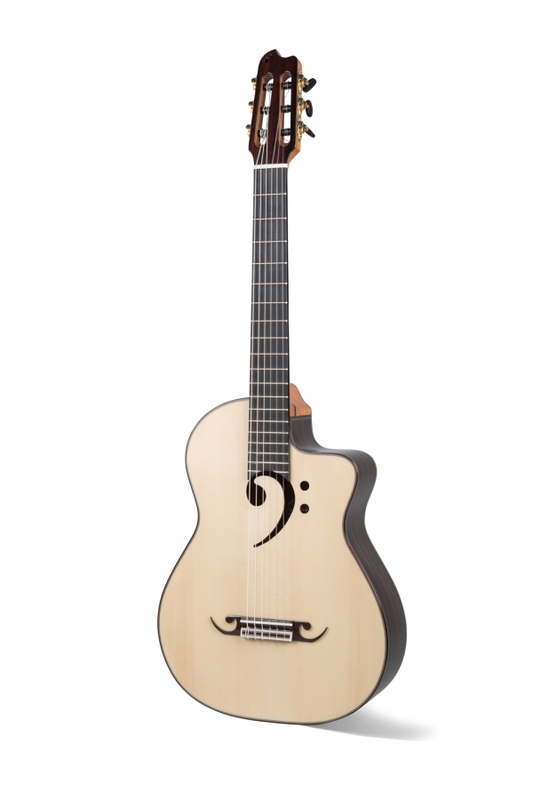 How much does a baritone classical ele/acoustic cutaway model cost in USDollars please? The Raimundo Clave de Fa-E (electroacoustic version) cost 999€ (1.116 USDollars approximately at today’s exchange rate). Hello Remco, Yes, the guitar is in tune when we send it, but as they are totally new from the manufacturer with new strings, that may need some retuning at the beginning. Raimundo provide tuning guide with the guitar and you can also find that guide to download in our website.